Bothnic is a website let users can "share their own files in computers and others can download those files directly using browser". 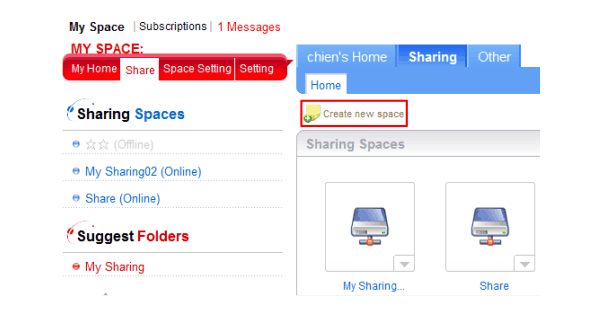 Users can click the right button on the mouse on files or folders in computer and click "Add Sharing", of couse you can remove sharing in anytime. 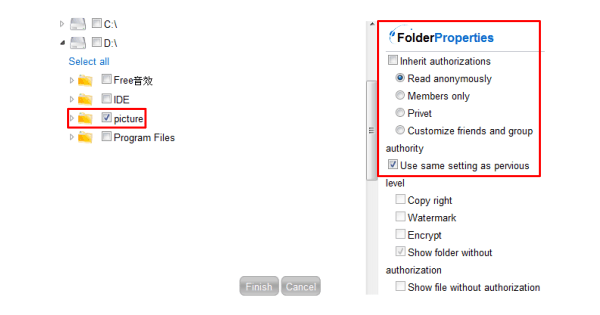 Then set the authorization as "anonymous read" let everyone can download files directly from your computer by URL! You also can set the authorization as member only, friends only or private. 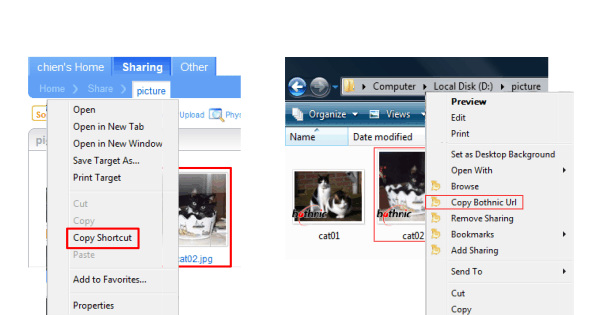 You can get the file sharing URL on Bothnic by copy "Copy Shortcut" or click the right button on the mouse on the sharing files or folders in computer and click "Copy Bothnic Url", in this example the Url is "https://www.bothnic.com/chien/Live/Share/picture/cat02.jpg"
Everyone who want to download cat02.jpg just goto "https://www.bothnic.com/chien/Live/Share/picture/cat02.jpg" then he or she can download the file. Bothnic is a completely free and full with functions' social platform. Using Web3.0's idea, help you manage sources from multiple computers, efficiently organize your pictures, videos, and files. Also helps you easily create private connections with friends. Simply install Bothnic Live and register on Bothnic webpage to start your sharing. For example: Online group project, remote office files, sharing GBs of files.... Sharing files as if all computers are in the same network. No need to be limited by Server space nor looking at compressed picture with bad resolution. Bothnic not only provide instant, safe, and convenient loading, but also provide online editing, auto synchronize...etc advance functions. Also we provide SMS function to increase the connection between groups and encrypt loading, zipping, and continuing loading to create a more efficient and save file sharing environment. 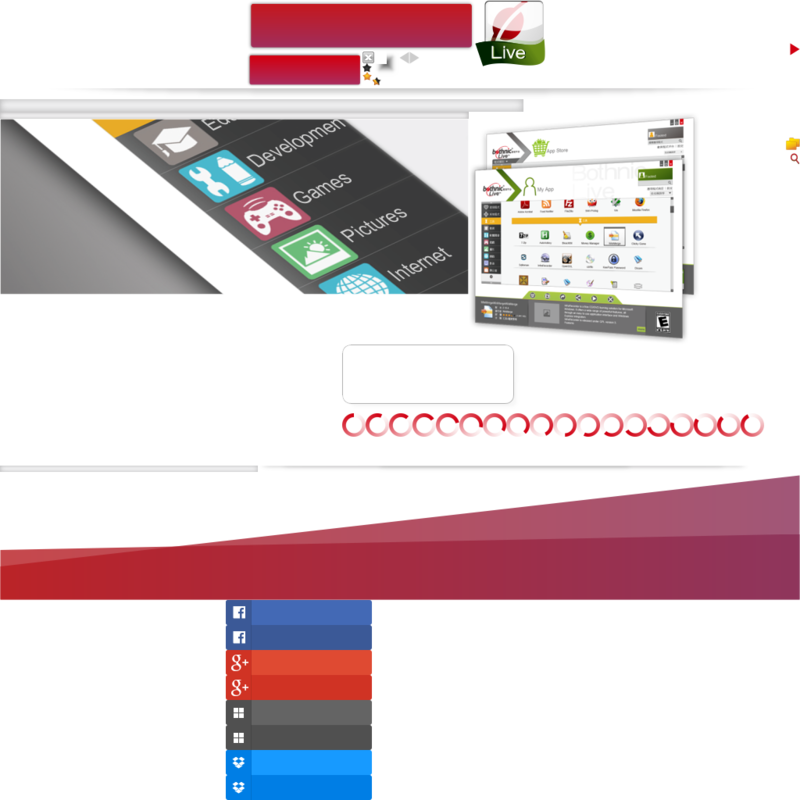 Bothnic Live is a software that help user to maintain and share files on Bothnic webpage. Bothnic Live will take in encrypt direction from Bothnic, and moniting file changes. Bothnic webpage will auto detect if Bothnic Live is installed and activate its advance functions. Through Bothnic Live, the download speed and stableness will increase. Function wise, it can upload or download folders and add continue loading function, so user doesn't have to worried about his or her internet is not stable or getting disconnect. User must install Bothnic Live on his or her computer in order to shard files. Large size:Use your own hard drive space and Ethernet, don't need to worried about limited web space. Now days hard drive contain GBs or even TBs of space, and internet storage is not used often, through Bothnic, the computer hard drive and internet storage function can reach its full capacity. Speed:Automatic zip the documents while transferring, largely increase file transfer speed. Automatic zip the file while transferring, increase the speed of file transferring, and save the time of waiting. Easy:Only need to organized the files and folders in your computer, the system will automatically organize your sharing list. And you only need to organize one files, the sharing files will automatically update, shaving your time on organizing files. Using listed of authorization, clearly listed who has the power to read, write, or edit. Never have to worried files get stolen anymore. Simple:Share your files no matter its in local network or behind firewall. No need to worried about the type of connection, whether you are using wireless internet on your laptop or router connection at home, you can always easily share your files. Convenient:Picture, video, and documents all organized by Bothnic. Easy to look for file name and details. System will create an index, make searing files easier and faster. You can now change settings of your file sharing using any computers. And you don't have to worried about forgetting your files at home anymore. Bothnic combined files transferring, files sharing, business application, network...etc multi-function system. 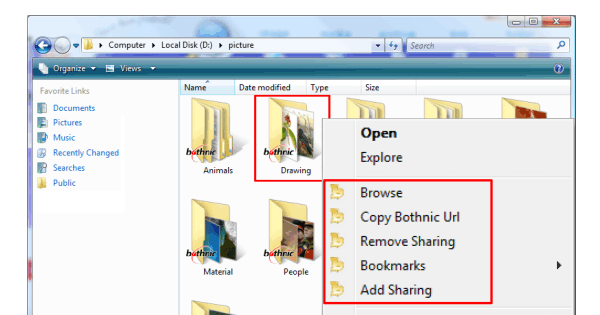 Based on Web3.0's idea, letting user using his or her computer to share files. This is a great solution to massive amount of files and instant connections. Bothnic used RSA+Rijndael encrypt transmission technique, creating a save platform for the user. Also make organization between multiple computers a lot easier and build connections between friends and groups with no boarder. Through Bothnic Live group sharing setting, simply create a wireless connection, there's no more limited web space. Synchronies folders and local computer, solving the issue of updating both files, and saving the time of file transfer between group members. Bothnic can zip and transfer files at the same time, increase the efficiency of transmission. When the internet is not stable, it will continue your download from where you stopped last time. This will make the transmission of large files easier. Search area can go from personal or group to everything in Bothnic. Key word index not only focus on file name but also files that contain the word, increase the speed of searching the file you need. All document transfer are recorded in the history. Member can use this function to check whether the files has been viewed, downloaded, or edited, and who was the user doing the action. Gather sources from all the computers, and create a file organizing system with your family. Create social network with friend's computer, like a small private network, fast sharing pictures, videos, and other files between computers. Through Bothnic's social sharing and searching, find the files you need in the large social group with anonymous files. Through synchronies folders, although group members are spread all over the world, everyone can still collaborate and edit the files conveniently.